As Park Grove Realty nears completion on its latest project 100 West Water Apartments, it welcomes its newest commercial tenants Wells Fargo and LaBella. The $14 million project is part of the $10 million Downtown Revitalization Initiative. Located at 100 West Water Street in downtown Elmira, New York between North Main Street and Clemens Center Parkway 100 West Water Apartments is the first new building in the Southern Tier city in decades. The modern four-story building is designed to house 51 private residents in one and two bedrooms on the top floors and commercial tenants on the main level creating a vibrant community. Apartment rents start at $995 and include balcony views of Chemung River, granite countertops, custom soft-close cabinets, stainless steel ENERGY STAR® appliances, high speed wi-fi & cable, and an in-unit washer and dryer. 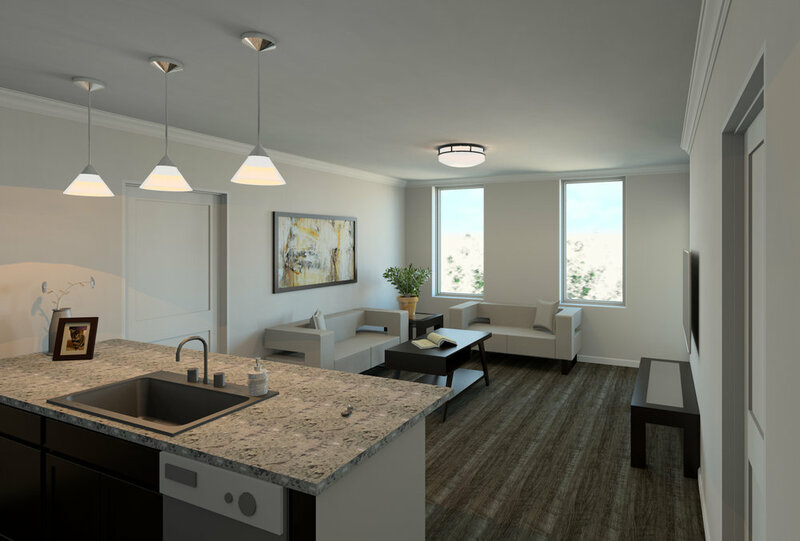 The 100 West Water Apartments are sure to be the most luxurious rental homes in the Elmira market. The state-of-the-art mixed use commercial real estate building includes approximately 6,000 customizable square feet of space that remains available . Ideal for any B2C business, 100 West Water Apartments window-front commercial spaces are on one of the most viable corners in downtown Elmira. Wells Fargo & Company financial services and LaBella Associates architecture firm are two of the commercial businesses set to move into 100 West Water Apartments this Spring. 100 West Water Apartments interior renderings of a private residence. National award-winning firm, LaBella Associates is known for their work building and renovating facilities, renewable energy solutions, community-focused infrastructure and environmental engineering. Their portfolio of projects includes the New York State Thruway Authority Bridge, Monroe County Crime Labs, the ESL Federal Credit Union Headquarters, CMAC, the Cleveland Clinic, and the Monroe Community College Downtown Campus. Headquartered in Rochester, NY since 1978, LaBella will be moving their Elmira location from 145 Prescott Avenue in Elmira Heights to the new 6,000 square feet space at 100 West Water Street. LaBella has begun build-out of the space and plans to take occupancy this Spring. Wells Fargo is also no stranger to the Elmira, New York area. The American-based multinational financial service company is currently located in downtown Elmira, on 160 North Main Street will be making a short move across the street to their customized space at 100 West Water Street. Wells Fargo offers personal, small business and commercial financial services. 100 West Water Apartments building exterior. 100 West Water Apartments has limited commercial rental space remaining, and is working to fill that space with additional businesses including a restaurant to give residents and downtown employees a convenient place to eat and socialize. Park Grove Realty is actively meeting with prospective commercial tenants & residents and expects to have occupancy begin on approximately April 15th. Applications for residential units are now being accepted. For more information and to reserve your unit today call 607-735-2233 or email 100westwater@parkgrovellc.com.